If there's one thing that isn't a guarantee it's the weather. But every few years all participants in the commodity markets take heed to the El Niño forcasts. Scientists had indicated that in 2014-15 there was an 80% chance of it being an El Niño year...they were right, although it wasn't until late February/early March 2015 that the phenomenon was confirmed to be in place. In Australia and Southeast Asia it has a correlation with drought-like conditions, in India the dry weather leads to smaller rice and sugar crops, and in portions of Africa it can hurt coffee and cocoa crops. In Indonesia, the world's #1 Nickel producer, dryer weather can also hurt the mining industry because there is less water to run hydro-powered equipment. It can also bring more rain than usual to South America, delaying coffee harvests and flooding out copper mines. Not all the news is bad, in the past couple decades the North American commodity production levels have been largely unaffected by this weather phenomenon. Grain markets have seen minimal effect, and Soybean & Corn growing regions in the Southern United States have seen more favorable weather conditions, usually resulting in better growing conditions and crops. One other benefit of El Niño is the stronger than average winds it can bring to the Carribbean, which can help break up hurricanes and make energy production in the Gulf of Mexico more stable. 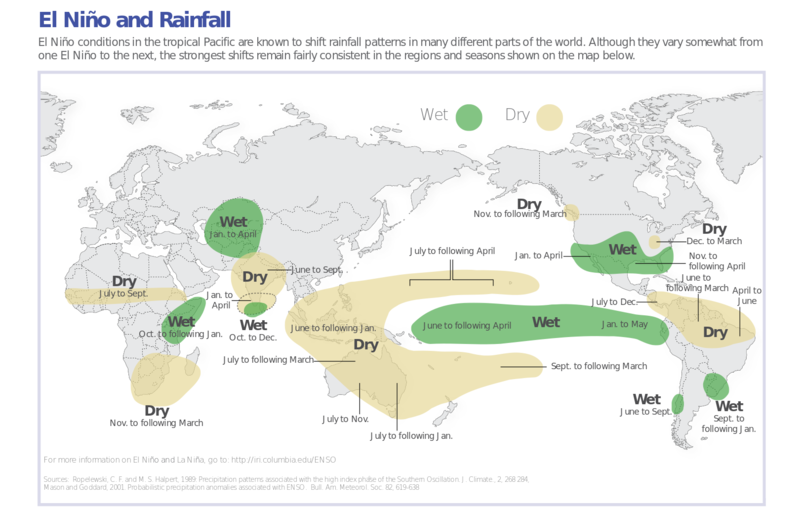 The NOAA government website Climate.gov released a map of their analysis on El Niño, and how it affects worldwide rainfall (click the image for the larger version).